YUM … Do You Have YOUR COPY? ​​​​FINALLY ... A Cookbook EVERYONE Can Enjoy --- even the difficult to feed & the hard to please. ​​​​Recipient of 13 prestigious awards and honors, internationally-acclaimed YUM is not only an invaluable resource and cookbook, but is also an inspiring story of one woman's transcendent journey of overcoming the impossible, from despair to triumph, sharing the gifts she discovered along the way. This book is a game-changing “must-have” for anyone who has ever felt betrayed by their body and for those who live with food sensitivities, autoimmune challenges, heart disease, cancer, autism, ADD, or diabetes. After the birth of my daughter in 1997, I found myself living a nightmare of disability and chronic pain, without anyone cluing in for over twelve years that her suffering was related to food sensitivities and autoimmune dysfunction. During that time, my greatest fear was that my daughters would be left motherless before they graduated high school. 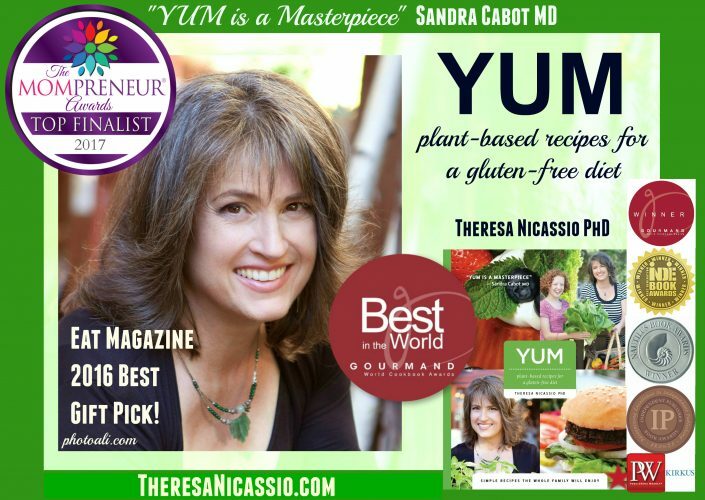 Recipient of 13 prestigious awards and honors, internationally-acclaimed YUM: Plant-Based Recipes for a Gluten-Free Diet is a beautiful cookbook filled with delicious and easy recipes, embedded in an inspiring story of one woman’s transcendent journey of overcoming the impossible, from despair to triumph. YUM lifts the spirit as the author shares the gifts she learned that enabled her to transform her life, empowering her readers with tools to help them enjoy more vitality and joy their own lives as well. Introducing her unique “YUM Living” system, based on her iFEEL Better Wellness System (Inclusivity, Food, Empowerment, Exercise & Love), Dr. Theresa Nicassio compassionately integrates her personal experiences of living with health challenges and expertise as a psychologist with her understanding about how your emotional relationship with food and your body can make lifestyle changes difficult. Integrating this knowledge about the Psychology of Eating with her skills as a chef and nutrition educator, Theresa holds your hand and makes it easy for you to invite more health and ease into your life, one simple (and delectable!) recipe at a time. YUM‘s 20-page glossary addresses your questions about cooking in a new way and demystifies the uses and benefits of ingredients that may be new to you. Its one-of-a-kind 10-page Special Diet & Allergy Chart makes navigating multiple dietary needs not only easy, but fun as well. Live, love and eat vibrantly with this game-changing “masterpiece”, regardless of health conditions like heart disease, chronic pain, cancer, autism, ADD, autism, food allergies, celiac disease, non-celiac gluten intolerance, autoimmune challenges, or other dietary restrictions. Recipient of 13 prestigious international and regional awards and honors (e.g. Publishers Weekly Starred Review, PW Indie Watch: Spring 2016, Gourmand International World Cookbook Award Winner -Best Diet Book in Canada & ‘Best in the World’, Kirkus Review, AMAZON #1 BESTSELLER, etc), Internationally-Acclaimed YUM is an inspiring story and educational resource that can help you think differently about your relationship with food, your body, and your loved ones. Offering not just hope, but also the practical tools, YUM is your guide to a whole new YOU, especially if you live with dietary restrictions due to health challenges. Unrecognizable here at 40 and with a failed immune system that hit her like a Mack truck after the birth of her daughter, Theresa’s “new normal” in life was filled with perpetual infection, inflammation and chronic pain. The small airways of her lungs were wrecked and her tonsils and glands were infected and swollen for at least seven to eight years straight, without a moment’s respite. 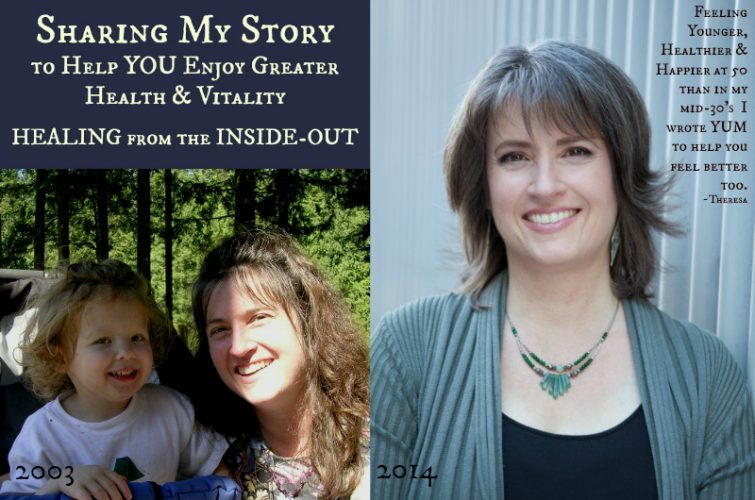 She had no idea that gluten and other food sensitivities were virtually killing her. Previous pleasures like singing, ballroom dance, power volleyball and hikes in nature became distant memories she thought she’d never experience again. She’s now sharing what she learned so that others don’t have to go through the same nightmare that she went through. 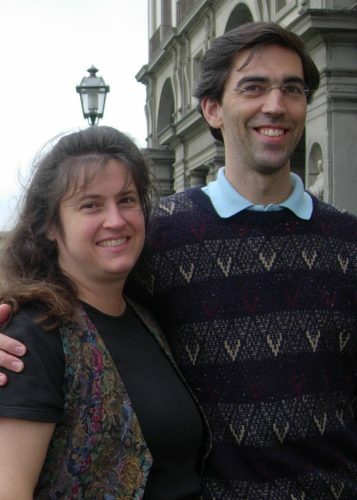 Now in her 50’s, Dr. Theresa Nicassio, Registered Psychologist #1541 is a living example of HOPE…Making a Difference Behind Closed Doors & Beyond. Instead of enjoying motherhood as the active woman she had been prior her pregnancy, Theresa found herself unrecognizable and betrayed by her body, living a nightmare of disability and chronic pain, without anyone cluing in for over twelve years that her suffering was related to food sensitivities and autoimmune dysfunction. During that time, her greatest fear was that her daughters would be left motherless before they graduated high school. Ironically, it was her hardships and discoveries along the way and her passion to help others avoid the misery that she endured that led Theresa to where she is today. While searching for a “cure” for her illness, she became a Certified Integrative Energy Healing Practitioner and began studying an array of osteopathic healing modalities, such as Craniosacral, Lymphatic, Visceral, and Neural therapies, eventually also attending culinary school with her daughter, where she became a Gourmet Raw Food Chef and an Advanced Raw Food Nutrition Educator. In her multi-award-winning bestselling book YUM: Plant-Based Recipes For A Gluten-Free Diet Theresa shares her personal challenges so that others might find hope from her story. The huge success of the book propelled her adventure even further, especially when it received a Gourmand International ‘BEST IN THE WORLD’ Award and a Publishers Weekly starred review, amongst many other prestigious national and international awards for its unique contribution addressing the special needs of those living with food sensitivities and other dietary restrictions. Advocating for health and social inclusivity, Theresa is now an international speaker, a radio show host, magazine columnist, and a celebrity host for Journeys with Heart’s upcoming riverboat cruise holiday helping BC Charities, as well as the creator of Theresa’s Wellness Hub at www.TheresaNicassio.com, supporting health and kindness everywhere she goes. 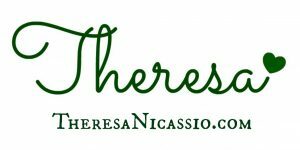 Offering simple solutions to the “ache” that so many feel about their health, their relationships, and the future of the planet, Theresa uses her integrated personal and professional knowledge to provide hope in the face of despair, helping those she serves heal from the inside-out.